“From little acorns mighty oaks do grow.” The old American proverb tells us that the acorn, fruit of the oak, is indeed powerful, though it is small. Acorns are not only capable of growing into magnificent trees, but are an important source of sustenance for all kinds of wildlife. The appearance of an acorn varies, depending on the species of oak it is from. There are two major classes: white oaks, which produce leaves with rounded lobes, and red oaks, which produce spiny leaf lobes. White oak acorns can be distinguished by the fleshy scales on the cap. Also, the inner surface of the cap is always hairless. The cap of the red oak acorn is flat and overlapping, and its inner surface is hairy. You are more likely to see acorns of the red oak than the white oak, since white oak acorns are more palatable to animals and decay more quickly than red oak acorns. 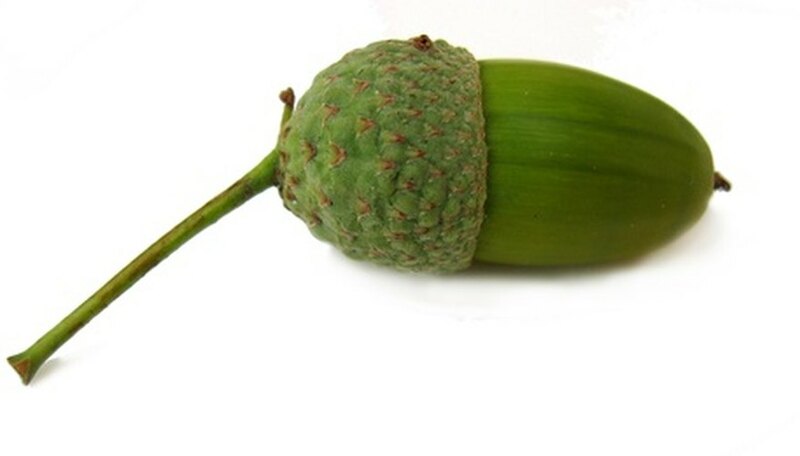 The acorn consists of three parts: the cup or cap, the tough outer shell, and the kernel. The cup can be smooth, or rough and prickly. Some cups are shallow, while others almost completely enclose the nut. The kernel consists of two seed leaves called cotyledons, inside of which lies the embryo, containing an oak in miniature. The shell in some species is round; in others, more narrow and tapered.The nuts can measure anywhere from 1/2 inch to 1 1/2 inches in length, and may be brown, yellow or green. Oaks are very long-lived trees, reaching 200 or more years, must be at least 20 years old before they start producing fruit, says the University of Tennessee Extension. By the time it reaches 70 or 80 years of age, an oak tree produces thousands of acorns annually. Oak trees sometimes rest for a year after yielding a heavy crop, so a tree may not produce acorns every single year. Acorns of the white oak are formed, mature and fall from the tree all in the same year. They are sweet to the taste and quickly eaten by wildlife. Any remaining acorns germinate in the same year they fall from the tree. In contrast, red oak acorns are not mature until the second year after they are formed, and do not germinate until the spring after they fall. Acorns of the red oak have a much higher tannin content, giving them a bitter taste; animals are more likely to hoard these nuts for later, says the University of New Hampshire Extension. Unlike other trees with light seeds which can travel on the wind, the oak is dependent of wildlife to spread around the relatively heavy acorns. Acorns are a critical source of food for many birds and mammals. An article in “National Wildlife,” the magazine of the National Wildlife Federation, estimates that acorns make up one quarter of the diets of animals such as white-footed mice, wild turkeys, raccoons, black bears and some squirrels. Squirrels, mice, and birds such as blue jays and woodpeckers stockpile the nuts to serve as provisions throughout the winter.